I visited my Dads house last week, and again, tried my hand at some night photography. The Milky Way had an orange hue due to a wildfire that has started that very day out in Warm Springs some 45 miles away. We were actually lucky to see any stars at all because of the smoke that took over the whole valley around Prineville near of where we were. This was especially true because the Perseid meteor shower was happening, and I really hoped to see some starry action. This old car recently came to find a home on their property and I did a bit of solo light painting. Luckily I saw a lot of meteors while we were out stargazing, including the one captured in this photo. Um, WOW! So gorgeous. :) Found you via Friendship Friday! Gorgeous capture of the night sky! Enjoy your day and the weekend ahead! Oh, a gorgeous capture indeed!! So much beauty!! Thanks for sharing, hope you have a wonderful weekend!! What a great photo! 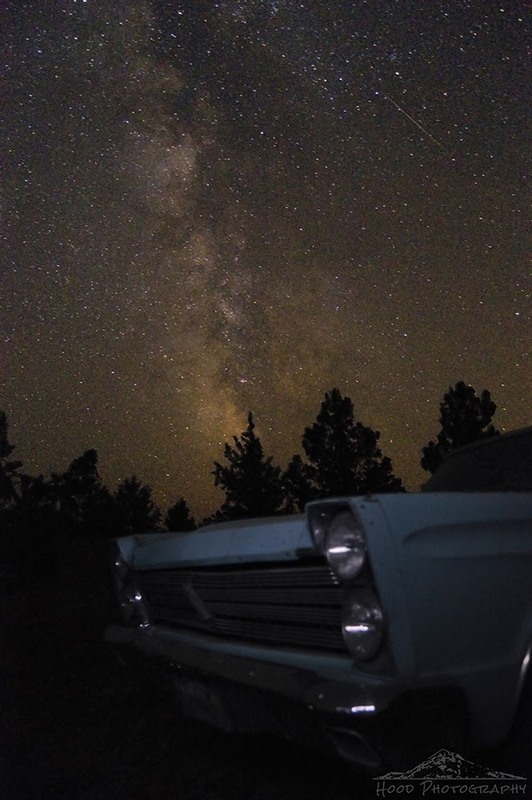 Love how you got the old classic car and the Milky Way in the same shot!! Great shot. Its impossible to see the milky way in my part of the world but you captured it impeccable. Great. Beautiful! It was cloudy in Michigan that night and we didn't get to see any meteors. Nice! I like it. Beautiful. Oh, to live where we could see the stars! The 'burbs cheat us out of such delights. This is an amazing image. Excellent image!!! Interesting foreground and silhouetted trees really complement the beautiful starry sky. Kudos!! !